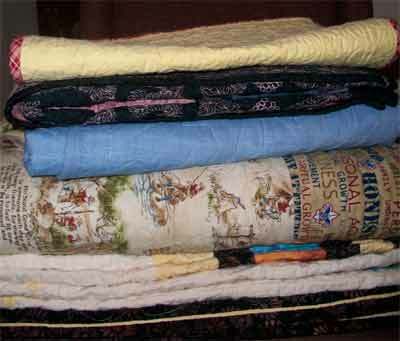 Here is a stack of quilts prepped for the guild quilt show this weekend. I have one more to add to the stack...but forgot to grab it before I took the picture! And here is my challenge piece all ready to go. I used beads and a clock kit to embellish it. 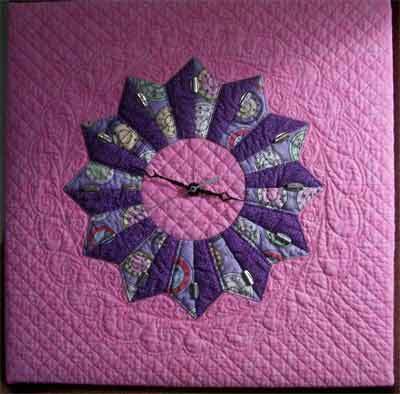 While the pink is washed out, you can see the quilting in this picture, so this is the one I'm sharing :) The hands of the clock came only in brass and the hands disappeared into the quilt, so they are now painted black with the second hand in silver to match the beads. I had fun with this challenge and have the added benefit of a new clock for the sewing dungeon! Today I have swap blocks up on my design wall. The Swap (as I mentioned in an earlier post) is for man-friendly blocks/fabrics. I'm marking the quilt top. I find it boring to mark quilt tops. That is why I usually freemotion quilt in all over designs. 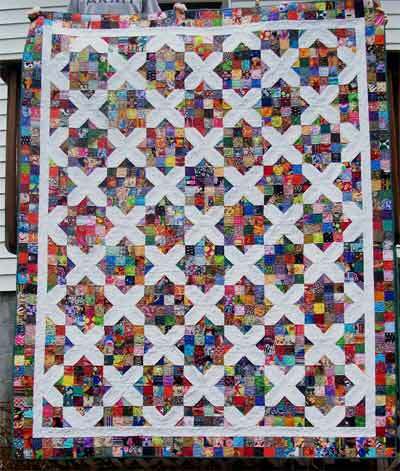 This quilt begged for a more traditional look than I usually do. so my lines could be consistent. 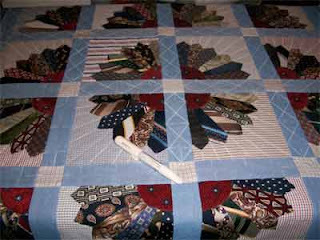 I'm hoping to be quilting on it tomorrow and binding it by the weekend. do you ever participate in block swaps? I do, though not as often as I did. I used to join every one I saw...and the postage about did me in! Now I'm a bit more choosy in which swaps to take part in. 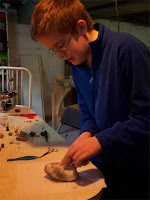 And I try not to do more than one at a time (keeps me from getting too confused!). I'm packing envelopes to send off in a Manly Man Swap. In this swap we made 12" blocks that are man-friendly. So the colors are not at all feminine :) And we shied away from floral blocks. 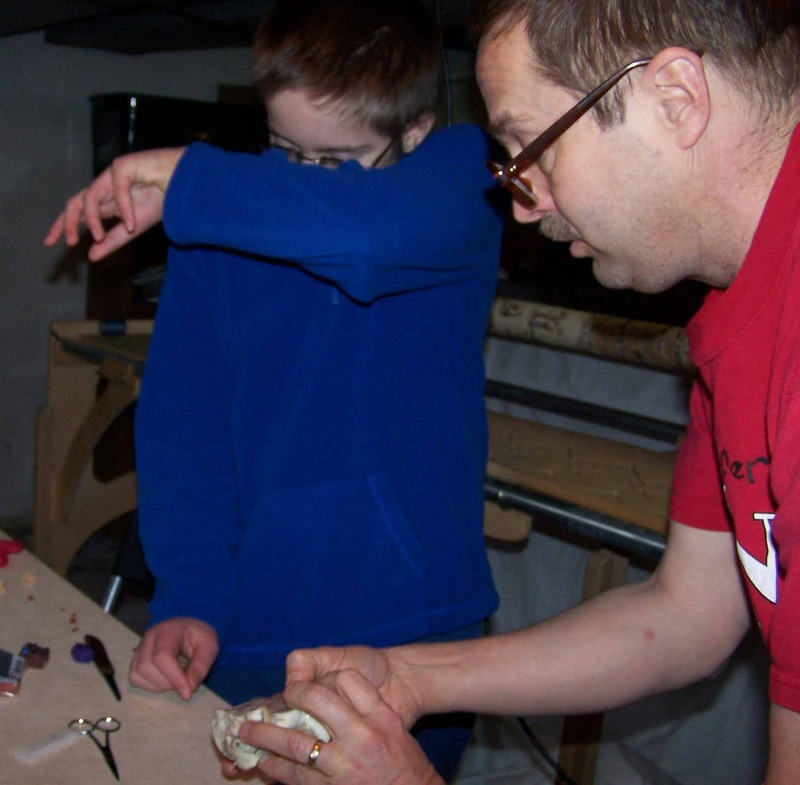 I made Antique Tile and Clay's Choice blocks. I worked totally from my stash, that is why they are not all the same fabrics. I used two different greens in the Antique Tile blocks and a variety of "fire" colors in the Clay's Choice blocks. 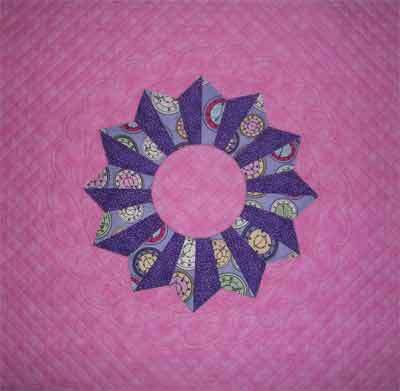 Now to design a quilt using 14 12" blocks :) EQ7 - here I come! 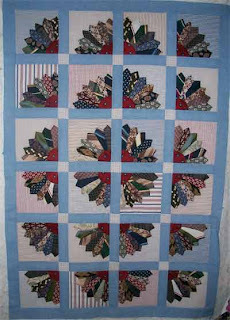 The backgrounds of the blocks all came from men's shirts and the sashing is chambray, so it COULD have come from a man's shirt. 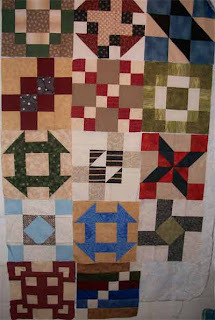 I'm now trying to figure out the quilting design. I think I know what I'm doing in the sashing, but I'm still not sure about the blocks themselves. 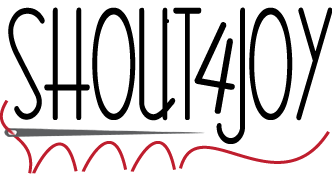 If you have any ideas, please share! 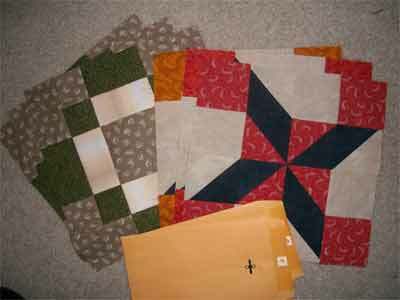 For those who are interested, I just finished the quilting on the challenge piece that I showed last week. 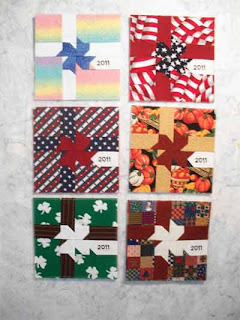 The Army Guy and I were just brainstorming about how to make the rest of my ideas for this little quilt work out. Next week it might all have come together (I hope!). 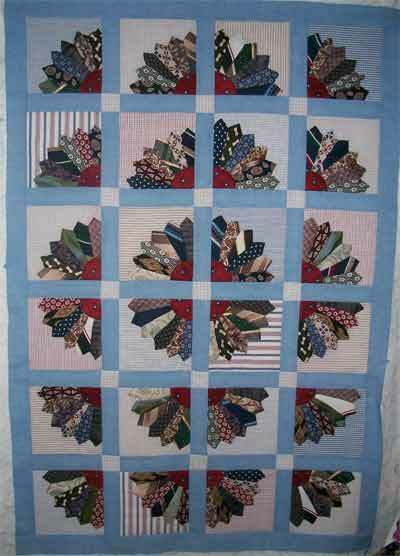 For more design wall inspiration, check out Patchwork Times! Nobody's Perfect is finally finished! 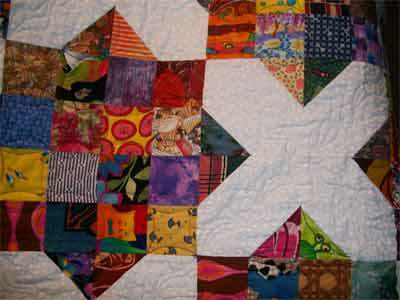 Using fabrics from Obnoxious Fabric Swaps, the quilt Nobody's Perfect (Even Fabric Designers) has been completed. I even sewed down the binding by hand (and I avoid hand work if possible!). The quilt finished up at 76" X 92"
The girls said I should call it No Thanks, YOU Take It as they both can only see the obnoxious fabrics, not the overall design of the quilt. 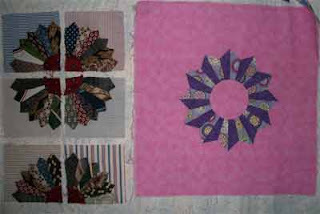 I am not sure if you can see the quilting. I quilted a running floral design in the white and just did the rounded outline thing (does it have a name?) in the rest of the block. For those wondering, the block is a traditional Arkansas Crossroads block. 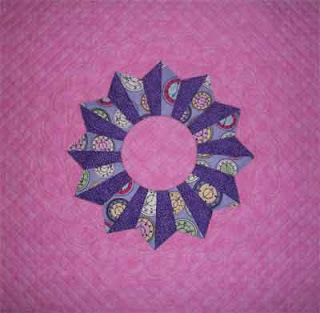 It is up for vote in The Quilting Gallery's weekly quilt contest, this week the theme is Scrappy. 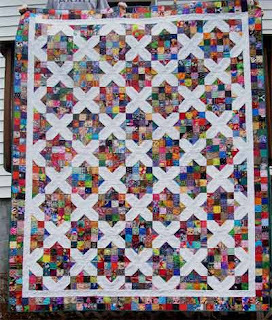 Please head on over there and vote for my quilt! I put the Father's Day Ties blocks back up. I worked on more of the wedges last week, but now have to cut more and cut the quarter circles for the corners of the blocks. I also figured out that I need to cut a couple more background squares. The pink block is new. It is for our Guild Challenge. We were each given the Clock fabric and the guidelines say that it has to be under 20" and embellished. I have an idea of where this is going, but I'm stumped on how I'm going to quilt it. If inspiration doesn't strike soon, it'll be a basic quilting design as I still have a couple other design dilemmas to puzzle out on how to get it work. 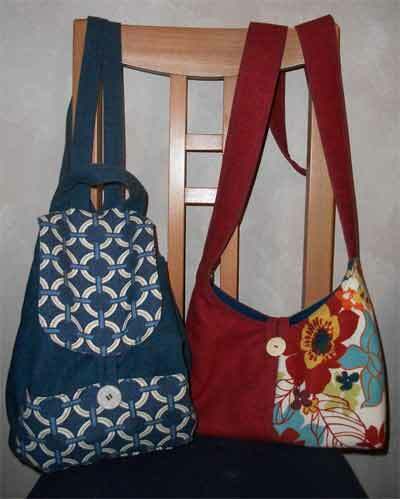 Over the last couple of weeks, I sewed up two different purses for myself. The one on the left is a backpack purse...I find them comfortable for long days of shopping. 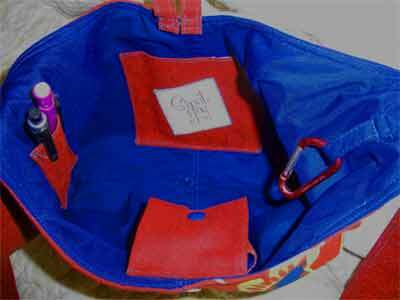 The one on the right is a modified Coming and Going Bag by That Darn Kat. I changed it up in that I really wanted a long strap so I could wear the bag across my body, rather than tucked under my arm. I also added a couple more inside things to help me keep (somewhat) organized: two more pockets and a loop with a carabiner for my keys. Here are six ribbons done for our guild quilt show that is coming up at the end of the month. Life Science...SO Glad the Army Guy Has Been on Leave! The Army Guy was all excited about discovering the different areas of the heart and comparing them to the diagrams in the textbook. The Boybarian, not so much. He kept complaining about the smell of the preservative. 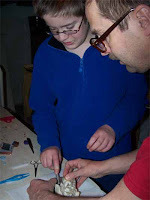 I am SO glad that this is one task this homeschool mom can pass on to the dad!